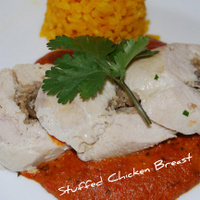 We decided to make David's quick and easy stuffed chicken breast recipe for Sunday lunch yesterday. We wanted something we could make ahead of time so that we could relax and enjoy a glass of wine on our terrace in the sunshine looking out at the Mediterranean. It's a dish that looks and tastes like Spain...yellow rice and lovely red romesco sauce and a combination of flavours ...sherry, garlic, red pepper, and hazelnuts. Really delicious. Check out David's video below on how to do the boning....it's a lot easier than you think. A glass (125ml.) of good Amontillado Sherry. (Not the very dry Fino). Make a recipe of our own Romesco Sauce. Watch this guide to deboning a chicken or have the butcher do it for you! First take a chicken breast and lay it on a large piece of cling film. Flatten it out gently with a meat hammer, until it's of even thickness, approx 1/4 inch. Repeat with the other one. Then make your stuffing by frying the onion in a little olive oil over a gentle heat until soft and golden. Add the mushrooms and fry for 2 minutes then add the sherry, tarragon and seasoning to taste. Continue cooking gently until the mixture is almost dry. Turn down and allow to simmer gently for 5 minutes, then turn them over and simmer for 5 minutes more. Turn off the heat and allow to stand for a further 5 minutes. Take them out of the cling film and cut into neat slices on a clean chopping board. See pictures. Spoon the hot romesco sauce (this can also be made in advance) into the middle of two warmed plates. 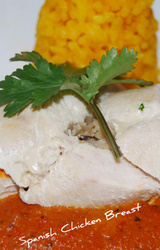 Arrange the chicken slices on top and garnish with some parsley.